Caddo Lake is impounded by Caddo Dam in the Cypress Creek basin in Caddo Parish, Louisiana, and extends into Harrison and Marion counties, Texas; the center of the lake is located twenty-nine miles northeast of Marshall (at 30°42' N, 97°20' W.) The lake, named for the Caddo Indians, was one of the largest natural lakes in the South prior to the construction of the dam. 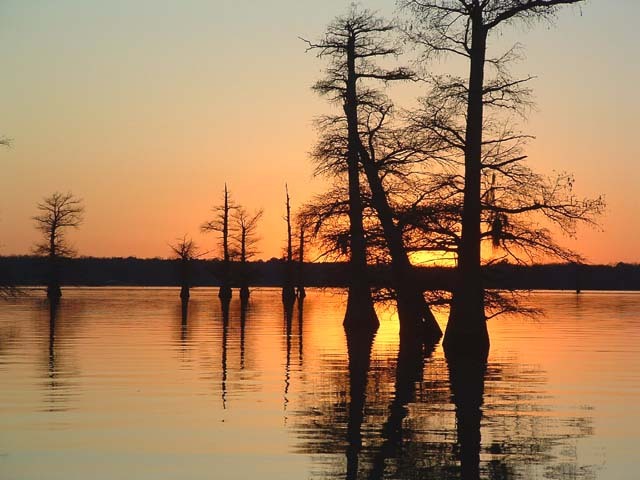 According to Caddo legend the lake was formed by an earthquake caused by a Caddo chief's failure to obey the Great Spirit. The more prosaic explanation of the lake's origin is that it was formed behind a log jam in the Red River. In 1874 the United States government destroyed the log jam, or Red River Raft, as it was called. 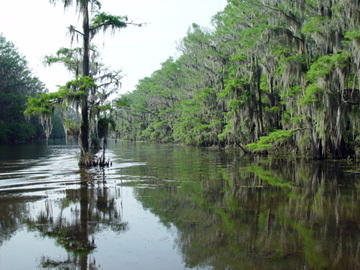 Along the shores of Caddo Lake and Cypress Creek are to be found many towns and ghost towns dating back to the days of the Republic of Texas. Swanson's Landing on Broad Lake was near the place of the burning of the steamer Mittie Stevens in 1869, when some sixty persons were burned to death at night, not realizing that the shore was so close or the water so shallow. Farther up the bayou were Port Caddo, the port of entry for the Republic of Texas in the northeast, and Benton, from which much of the river freight was distributed to other parts of Texas before Jefferson became the head of navigation. A short distance inland from Port Caddo is the site of Macon, called the "Lost Colony" after its settlers moved to Port Caddo. Another point of historical interest is the government ditch that was dredged upstream toward Jefferson so that cotton could be shipped from Texas to New Orleans on the Red River. The Caddo continued to live in this part of Northeast Texas until as late as 1842. The last Caddo Indian Village in the Caddo Lake area was settled about 1800, and this village is thought to have been situated on James Bayou. The Caddo peoples were removed to the Brazos River area by the U. S. Government and the Republic of Texas in the 1840s-1850s, and then they were removed again to Oklahoma in 1859. The Martha McCraw Chapter was organized in Jefferson on February 22, 1955 during the term of Loretta Grim Thomas, Texas State Regent, 1952-1955. Twenty eligible women became charter members. The chapter has more than doubled in size and draws members from the East Texas area. Contact us for information on membership or meetings. Martha McCraw was born Martha Lumpkin, granddaughter of a captain in the Army of Virginia, who married William McCraw, an immigrant from Scotland, who served in the Revolutionary Army. She was both a granddaughter and a wife of a soldier in the American Revolution.